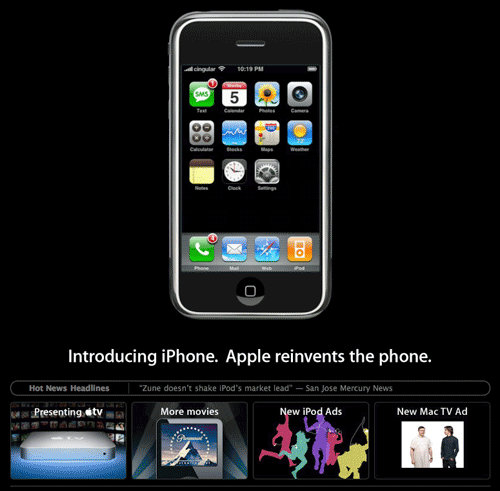 Steve Job’s 2007 Macworld keynote address brings exciting new products and changes for Apple. One big surprise is the change in Apple’s name. Apple will no longer be Apple Computer Inc., but now just Apple Inc. The new products announced include the AppleTV, iPhone, and a new airport base station supporting 802.11n. The addition of Paramount to the iTunes store was also mentioned. Steve spent very little time discussing the AppleTV during his keynote, and focused mainly on the iPhone. There was no mention of Leopard, which was heavily rumored to be released at Macworld. More information on Apple’s new products can be found below. The phone will be offered exclusively through Cingular in the US in June, and will come to Europe in Q4 2007, and Asia in 2008. A 4 GB model will be offered for $499 with a 2 year contract, and an 8 GB model will fetch $599 with similar contract provisions. The phone can be purchased through Cingular’s website or via the Apple Store. Apple today formerly introduced the Apple TV. The set-top unit, first previewed during the “It’s Showtime” event in September 2006 is geared toward streaming content from your computer to a widescreen TV. The Apple TV will ship in February, and is available for pre-order today at the Apple Store. Although not mentioned during Steve Jobs’ keynote address, Apple has updated their Airport Extreme base station to include 802.11n compatibility, producing up to 5x the performance and up to 2x the range as the previous Airport Extreme model. The new model also comes in a modified enclosure that closely resembles the Apple TV. 3 10/100 BASE-T Ethernet LAN ports for connecting to local networked devices. Security slot and 12v power.